It is unusual to come across any high street estate agent that does not have a window adorned with dozens of photographs of properties either for sale or available to rent. With the competition in the property market heating up once again after the recent recession, every high street estate agent is looking for ways to differentiate themselves and stand out to people who are searching for a property to buy or rent and those with a property that is ready to go on the market. Step into the estate agent’s office, and you are likely to find yourself confronted with even more properties displayed tastefully in wall-mounted or freestanding illuminated display units, precisely positioned to ensure that customers fully appreciate their potential and appeal. Although there are several different options open to estate agents, including low-tech solutions like acrylic display stands and leaflet holders and high-tech computerised display screens, LED estate agent displays still make up the majority of solutions that are in use here in the UK. The four most commonly given reasons for this dominance are examined in some detail below. Available to fit a variety of paper sizes, the use of LED displays is not limited to just the estate agent’s office windows. Freestanding LED displays with low-level lights can be used to display property inside the office, along with wall-mounted and suspended options. 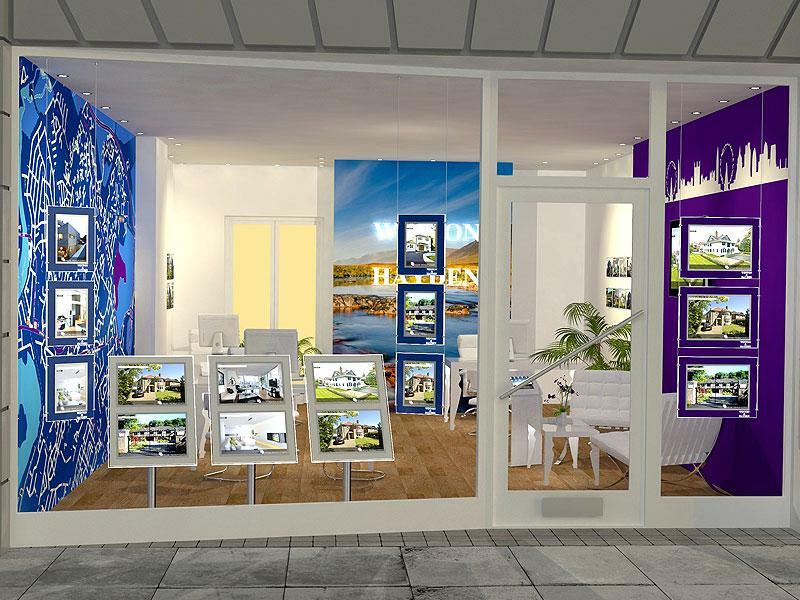 Even when just used as window displays, LED estate agent displays can be configured to suit the size and shape of the area, allowing business to truly benefit from every valuable square inch of window space. Pre-packaged cable display poster kits are available for A1 to A5 sizes and contain everything required to create a professional-looking and eye-catching window display. Freestanding units can also be quickly and easily swapped around to create a nice variety in the window display and draw in repeat views whilst also allowing the estate agent to give equal exposure to all of the different properties they have available. In such a highly competitive and changeable market, estate agents are continuously seeking ways to maximise the returns that can be reaped from limited budgets. Because the LED light pockets most commonly favoured by estate agents utilise eco-friendly lamps with a lifespan of up to 60,000 hours, these displays are a very cost-effective way of achieving a high-end look whilst still remaining environmentally friendly. In addition to the relatively low running costs involved in using LED window displays, these kits are also very easy to assemble. Instead of having to bring in specialist engineers to assemble and fit the window display and incurring the additional cost involved in doing this, most of the kits on the market contain everything that an estate agent needs to set them up by themselves. The cost savings continue each time the estate agent wishes to alter or completely change the window setup because this can be done by a staff member rather than costly external contractors. For agencies that have a higher budget for their window displays and can afford to pay a bit more toward the ongoing running costs, new technological advances mean that cable kits with tiny embedded LED within the acrylic pockets are also available. These pockets are impressively thin, measuring less than 20 millimetres even with the integrated lights, and because the bulbs sit within the framework, the posters on display are extremely well lit from behind whilst also bouncing off the edges of the frames. After the internet and print publications, estate agent windows are commonly seen to be the next place to browse the available properties in an area and also to get a general feel for what your money can buy you. People who are not currently in the market for a new premises will often stop just to browse an estate agent’s window and see what is out there, and all this passing traffic can serve as extremely valuable subconscious advertising. Thanks to the aforementioned illuminated solutions, estate agents can advertise to passersby at any time of day or night, whatever the season, and whether the estate agent’s office is open for business at the time or not. Perhaps the biggest reason for the continued popularity of LED window displays in the world of estate agents is that they are one of the most widely sold solutions for advertising in shop windows. This means that people have become familiar with how to install and look after them, reducing the amount of time that can be wasted trying to understand a new type of display. In addition, should new parts or even entire new display sets be required, they can very easily be sourced and delivered to the site with very little delay. Competition amongst manufacturers of LED window display solutions has also kept the upfront costs down and ensures that they continue to be the estate agents window display solution of choice. It would appear that LED displays in estate agent offices are a sight that will continue to be seen for some time to come. The old saying “If it isn’t broken, why fix it?” is definitely applicable here, and in this case, LED displays are not just “not broken” – they are totally suited to the needs of any estate agent worth their salt!